High Temp Cheese adds great flavor to your sausage and won't melt during the cooking or smoking process since it has a 400 degree F melting point. Great for summer sausage, brats, and snack sticks. Our High Temp Cheese is conveniently packaged into 1 lbs. packages and already diced into 1/4" pieces for a ready to use product. 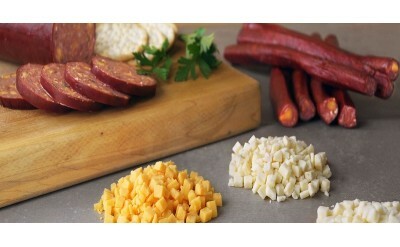 Choose one of our popular high temp cheeses to use in your next batch of homemade sausage.